Kosher, Sea, Pink, or Grey Salt - How Do I Decide? Have you ever wondered why there are so many different types of salt? What could possibly be the difference between them all? I know I was confused at first. Here's a bit of what I've learned over the years and how I use these different salts. Kosher Salt: My "go to" or "workhorse" salt. 90% of my cooking is done with this salt. It's cheaper to use in bulk so it's great for pasta water, general seasoning of dishes and of course, salting my margarita and bloody mary glasses. Sea Salt - Maldon is my favorite. It hails from Essex, England and is not processed in any way. It contains no chemical additives to make it free pouring and so it has the pure salt taste of the sea. The taste is saltier, which makes it possible to use less then the box salt probably sitting in your cabinet right now. The delicate natural flakes make it easy to pinch and crush between your fingers right into your pan and easier to see exactly how much salt you are using. 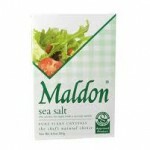 I also enjoy the flavor of Maldon's Smoked Sea Salt. It gives a surprising lift to ordinary sauteed veggies, macaroni and cheese, chicken and fish. 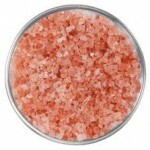 Pink Salt - Mined from the foothills of the Himalayan Mountains and is thought to be the purest form of salt around. The colors of this salt can range from sheer white, to pink and even deep reds based on the mineral and iron content found. 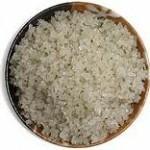 This salt is also often used by holistic chefs, in spas and by health professionals for the same reason. Bricks of solid pink salt are great for quick cooking proteins like fish and a wonderful presentation for sashimi, sliced fruit or veggies and can be used over and over again with a quick rinse of warm water. Grey Salt - Usually comes from France's Atlantic coast. Its light grey color comes from the minerals that are absorbed in the clay lining of the salt ponds. This salt retains all the minerals found in the sea and is full of magnesium, iron, calcium, potassium, manganese, zinc and iodine- all needed in our bodies as well. Slightly moist and chunky in texture, this salt should be dried out prior to putting it in a grinder or it will rust and clog on you. Simply pour out a thin layer on a sheet tray and allow to air dry over night. This salt is thought by many to be the best quality available and the preferred salt of Chef Michael Chiarello. 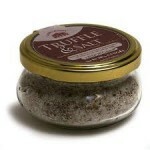 A couple of other noteworthy salts I use often are Truffle Salt and Black Lava salt. Truffle salt is a salt that has pieces of black or white truffle added to it. Truffles have a wonderful earthy flavor but can cost an arm and a leg, anywhere from $200-to $1,000 per pound. That's why Truffle salt is a great value. I use my 3.5 oz jar of truffle salt all the time and because you only need a pinch for a boat load of flavor it lasts and lasts. Use truffle salt as a finishing salt on foods that have a bland flavor to begin with: pasta, baked, mashed or french fried potatoes, fish, vegetables and even popcorn. Three words: DE Lish Ous! Last but certainly not least, I use black lava salt for its dramatic color it adds to certain dishes when I'm entertaining. Black lava salt is from Hawaii and is a blend of sea salt and purified volcanic charcoal and should not be confused with Black Indian Salt which is very pungent and more grey then true black. In the summer, when I make a Caprese salad of fresh mozzarella, tomato and basil, I'll sprinkle a bit of black salt over the pristine white cheese. Potato soup finished with a dash of black salt is simply elegant. This salt is only a finishing salt. 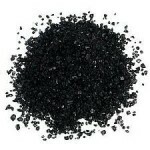 If you use during cooking, it will just leave black residue in your pot or dish, which loses its effect. Next time you're in The Chopping Block, ask if you can taste test our salts. You'll walk away with some new additions to your kitchen cabinet!